After installing VCD 9.1 its observed the HTML5 tenant portal is blank. The legacy Flex based tenant portal is fine. The reason for the blank screen is missing ‘Tenant‘ in Tenant Portal URL syntax. The issue resolved after adding tenant as suffix. 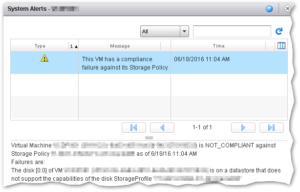 VMware vCloud : This VM has a compliance failure against its Storage Policy. After changing the storage profile of the VM you may observe the following error in ‘Status‘. To reset the alarm in the vCloud Director. Click the System Alert and select ClearAll. If many VMs have the same alerts then its difficult to clear one by one. In that case we can use SQL statement to clear all alerts. Log in to the database with Admin credentials using Microsoft SQL Management Studio. Please find the Powercli script for configuring Perennial reservation on all RDM luns in a ESXi Cluster. Please change the value for following variables before you execute the script. This is the flow of script execution. 1. Get the list of RDM LUNs from the cluster. 2. Check the current perennial reservation status of the RDM. If it’s TRUE, no changes will be applied. 3. If the status is FALSE, the perennial reservation will be set on the LUN. 4. Script will query the latest status and the status will be displayed. The result, after executing the script, looks something like this. #$vcenter = #"vCenter Name "
write-host "Configuring Perennial Reservation for LUN $naa......."
Recently one of the community members had a requirement to generate report with the following details in .csv format. – Category Names as columns and Tag names as values. The following PowerCLI script will help to achieve this. Create .csv report with Virtual Machine Tag, Category, VMware tools version and VM Hardware details. Connect-VIServer vCenter1 -user user1 -Password "password"
$vmInfoTemp | Add-Member -MemberType NoteProperty -Name VMName -Value ""
$vmInfoTemp | Add-Member -MemberType NoteProperty -Name ToolsVersion -Value ""
$vmInfoTemp | Add-Member -MemberType NoteProperty -Name HWVersion -Value ""
$vmInfoTemp | Add-Member -MemberType NoteProperty -Name $tempCategroy -Value ""
$vmInfoTemp | Add-Member -MemberType NoteProperty -Name $_.name -Value ""
Powershell oneliner to find the VMware softwares installed, version and installDate. #vmwTip 1 : Powershell oneliner to find the VMware softwares installed, version and installDate. I was in search for a script to generate report on vCPU to pCPU ratio and vRAM to pRAM at cluster level in a vCenter. Found couple of interesting community threads which address part of the requirements. Thought to consolidate (or extract:) ) the code and created the following. The report will be generated as CSV file. Connect-VIServer $VC -User "test" -Password "test"
##Calculating the vCPU to pCPU ratio AND vRAM to pRAM ratio.